Today we are going to be talking about fried chicken. Not fried chicken that you have to heat up a vat of oil for, though. Easy weeknight fried chicken that you make right on the stovetop, that doesn’t make a huge mess or tons of oil stink, and that is perfectly crispy and delicious every single time. Perfect for a Monday, practically a health food, that sort of thing. I know fried chicken on a weeknight isn’t something we do a ton (it’s super rare for us, although I wish it weren’t so), but once you have the method down it really doesn’t take a ton of extra time or effort, and the results are SO rewarding. 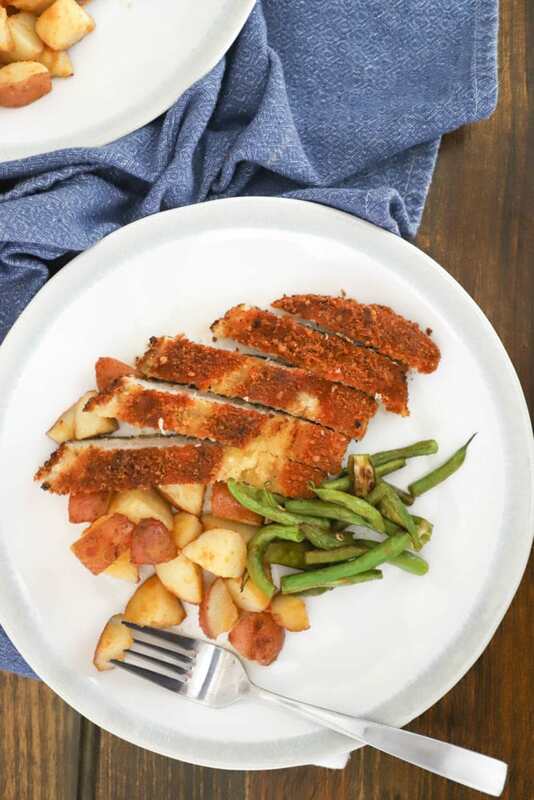 This particular chicken cutlet is wonderful on its own with a side dish or two, but is also yummy sliced over a salad or doused with some marinara for a quick chicken-parm type of meal. Or OR! You could put it on a sandwich and that wouldn’t be a bad thing at all. A note on portioning here: Once you pound a chicken breast (which is really a half breast, but the regular cut from the grocery store, boneless and skinless) to a thin thickness and bread it, it can seem pretty huge. If you have big appetites you could certainly make one chicken breast per person, but I find that one chicken breast is more than enough for two servings, especially with other things on the plate. Of course, you can also make ten of these at a time and have leftovers. Make ten for sure. Cool story: It’s my birthday week so we’re starting with fried chicken and heavy cream and calling it a balanced dinner because there’s a salad on the side. I am not about shaming relating to food in general, but if there was ever a time to indulge, a birthday is it, right? Of course, this year, my birthday is Wednesday, the most anticlimactic of days, and there’s work and toddler things and it’s raining and in that case we just absolutely need to have a delicious, tasty, SIMPLE meal. (it should also be noted that I had a lovely birthday celebration on Saturday with my family and got some super duper generous and fun presents) It has very few ingredients, so they all matter a lot – salted butter, fresh portobellos, heavy cream. Things that are great on their own and super delicious when combined. The method is simple and stolen somewhat from Lydia’s Kitchen, which we’ve been enjoying a lot on Amazon. Her presence calms me, as does her pasta. The chicken is dredged super quickly in a little flour, then pan-fried in oil and butter. 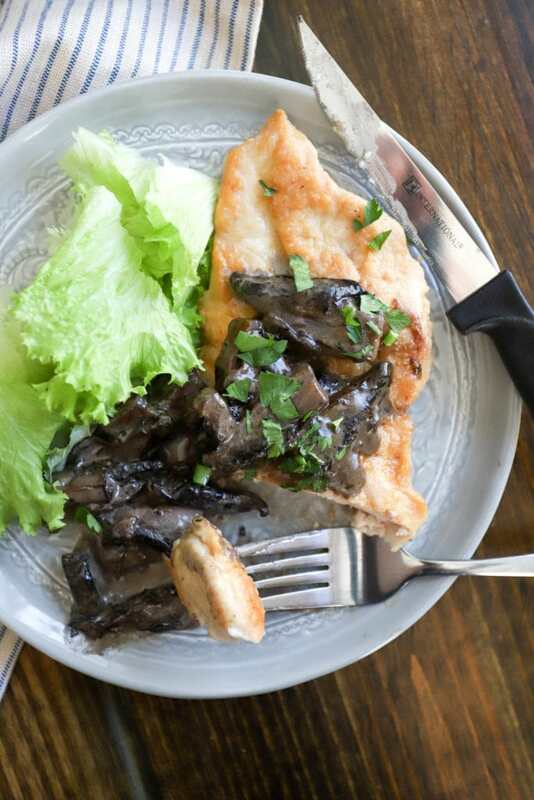 When it’s done, the same skillet is used to make a 5-minute mushroom sauce, then we pour cream into the skillet and dinner is done in seriously 20 minutes. I think a super simple side salad is very European, but if anyone made this for me over, say, buttered pasta I wouldn’t necessarily be pissed about it.